ORMA’s 2nd General Assembly (GA) was memorable and productive. Over 125 people were in attendance and the dialogue was passionate and profound. Please take a peek at the agenda for the day to get a sense of the range of issues we discussed. Many participants spoke of the usefulness of the municipal sessions, where a great group of speakers were concrete and specific in their guidance to support city and town candidates and inspired our members to run in their local elections. The discussion of ORMA’s efforts to help transform the Democratic Party was also a highlight, inspiring many to want the same amount of time and level of detail dedicated to all ORMA committee projects and priority discussions at future GAs. Each affiliate and caucus will submit 1-5 priorities they plan to work on in 2019. These priorities will be presented at the in-person Representative Council (RC) meeting to be held the last weekend in February. Along with their 1-5 priorities, RC Reps are being asked to submit what actions their group requests support with and how their group plans to measure success for each priority. Reps shall discuss ways to coordinate these priorities, and how ORMA can support their efforts statewide, and potentially nationally. All in all we shared, we discussed, and we inspired one another. 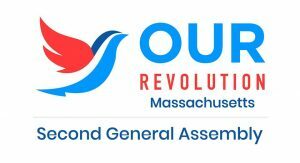 Our next step will be to take our collective priorities and to develop a measurable strategic plan for implementing successful priorities throughout Massachusetts and beyond. Looking forward to seeing many more of you at the next GA! Check out some photos and GA comments below! Inspired by the re-cap of our first 2019 General Assembly? Become an ORMA SUSTAINER now!